We expected to see lots of “new tablets, smartphones, Ultrabooks and semi-pointless gadgets” at this year’s CES but I think it's been better than that. So far this week we haven’t looked at any smartphone news, so I think it’s time to do a roundup of the smartphones shown off at CES. We’ve had a high end effort from Sony, Windows and Android phones from Huawei and Lenovo have shown off a new Android smarrtphone with an Intel Atom Z2580 (Clover Trail+) processor. Let’s look at each of these in turn. This is to be Sony’s new flagship phone. The Xperia Z sports a 5-inch Mobile Bravia Engine 2, full HD screen with a pixel density of 443ppi. It’s powered by a 1.5GHz Qualcomm Snapdragon S4 Pro quad-core processor paired with an ample 2GB of RAM. This water and dust resistant smartphone is only 7.9mm thick. The device has a 13MP rear facing camera and a 2MP front facing one. The main camera uses Sony’s Exmor RS sensor. Sony says that this camera is also capable of HDR video recording. With these high pixel count pictures and videos you won’t want to run out of storage; luckily the built-in 16GB of storage can be supplemented with a micro-SD card. The Xperia Z runs Android Jelly Bean and offers 4G LTE and NFC connectivity options. Rounding off the package Sony has installed a 2330mAh battery. UK retailer Clove has listed the Sony Xperia Z at £528, also it will be available from Phones 4U starting from March. Huawei has shown off new smartphones at CES for both Android and Windows Phone platforms. 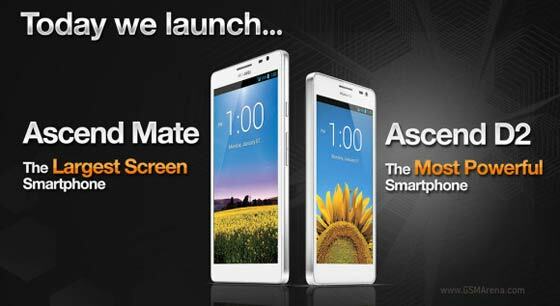 The Ascend Mate has a stonking 6.1-inch 720p display. To make the screen feel less humungous Huawei has worked to make a very slim bezel with the screen covering 73 per cent of the front surface. This phablet is powered by a quad-core 1.5GHz processor paired with 2GB of RAM. The Ascend Mate offers a pair of cameras with 8MP at the rear and a 1.3MP snapper on the front. Looking through the key specs; 4G isn’t on offer but a microSD card slot is. The Ascend Mate runs Android Jelly Bean and should have good stamina thanks to its 4050mAh battery. It’s expected to be made available in February, starting in China. The Ascend D2 is going to be made available in both 4.7-inch and 5-inch 1080 display versions, containing the same “guts” as the Ascend Mate detailed above. Unlike its bigger brother the D2 lacks a Micro-SD card slot but comes as standard with 32GB of storage built-in. Also due to being smaller Huawei has used a smaller battery offering 3000mAh capacity. Turning to the Huawei Windows Phone 8 offering now, we have the Ascend W1 smartphone. This smartphone is built around a 4-inch 480x800 IPS screen. The phone is powered by a dual-core 1.2GHz Krait processor, paired with an Adreno 305 GPU. The photographic side of thinks is catered for by a 5MP camera on the back which is capable of 720p video recording. Being a Windows Phone the W1 is available in several colours including black, white and blue. This 10.5mm thick smartphone should be available in Europe by next month and priced to compete with the likes of the HTC 8S. Here’s another big screen phone. The Lenovo K900 is powered by the recently announced Clover Trail+ SoC. The Android Jelly Bean device has a large 5.5-inch 400ppi 1080p IPS screen protected by a sliver of Gorilla Glass 2. The imaging capability of this phone is quite impressive with a 13MP f1.8 camera on the back, which uses a Sony Exmor BSI sensor, and a front facing “super-wide” snapper. The dual-core Intel processor, estimated to run between 1.5GHz and 1.8GHz, is supported by an ample 2GB of RAM and the phone has 16GB of built-in storage. This smartphone is 6.9mm thick and tips the scales at 162g. The Lenovo K900 is expected to be available in China starting in April and will also be made available in other select markets.